To say that German label Pure Steel Records is following the latest metal trend of the New Wave of Traditional Heavy Metal (NWOTHM) would be a major insult. Pure Steel has been a monument to and a fine purveyor of classic heavy metal for years. If anything the current trend has inspired more bands to form and allow labels like Pure Steel to add to their roster. Conversely, with attention and greater activity comes the greater chance that there's going to be more dross than gold out there. Of the two new bands for consideration, Canada's Savage Blade is spot on. However, with Sweden's Helvetets Port, Pure Steel may have been too quick to catch the crest of NWOTHM wave. 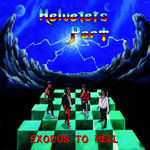 First, Helvetets Port's Exodus to Hell has all the marks of 1983 heavy metal. Though they do not wish to be considered a parody, thanks to their album artwork and general appearance, Helvetets Port comes across as campy facade like the original Batman television show. Calling it an homage to the past may be pushing it, but it may be you're only recourse. Positively, Helvetets Port has the music of that early decade nailed down in their arrangements. Negatively, they're average musicians, the arrangements are second rate Icarus Witch, and the lead singer can't sing. However, Exodus to Hell is still curiously entertaining and suspiciously addicting like checking your Facebook account hourly. If old school is the new school, Helvetets Port has been seriously held back. 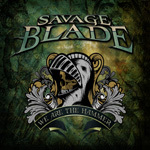 Savage Blade' We Are The Hammer, on the other hand, is a striking representative of how the old school of metal is made fresh for today. All the nods to 80's metal are there, yet with with greater skill, professionalism, and head banging, balls-to-wall intensity. For a band so young (formed in 2008), the show a measure of musical deftness and maturity beyond their collective ages. Savage Blade can run with the wild wolves on roaring metal landslides like We Are The Hammer and Stallions of the Highway. Or they can transcend and inspire with an epic metal anthems like Willow Run, Magic of the Night, and The Eagle is Stranded (listen for the well-place piano seques). However, not all is perfect here: Silver Ghost and Crowfoot are interesting, but ultimately rather dull. Still, Savage Blade's We Are The Hammer is an outstanding debut of signature classic heavy metal, and ahead of the class in the old school new school. Pure Steel Records offers us two bands in the classic metal tradition. Helvetets Port is strangely compelling, but ultimately a poor man's Icarus Witch. Savage Blade, on the other hand, is truly making the old school the new school of metal with their compelling and skillful debut.